I found out today that our top performing student was not admitted into her first choice middle school. Meanwhile, our student who refuses to do pretty much any classwork got into that same school. The injustice of it felt overwhelming at 8:20 am. The top performer has done everything we've asked her to do since we've known her as a 4th grader. She's scored all 4's on every state test she's taken. She's kind, respectful, and always goes the extra mile whether it's a homework assignment or a long-term project. When you look over the middle school options within walking distance of our school, most of the schools report 60 - 75% of kids feel safe in the hallways compared to 84% citywide average. Many of the schools have 20% or fewer kids passing state math and ELA exams compared to 41% and 38% citywide. I don't claim that these surveys or tests are a perfect measure of a school. As someone who teaches in a Renewal school, I know that our metrics don't paint a full picture of the love and dedication that we pour into our students. But I can't ignore those disparities either. Since this is my first year teaching 5th grade after eight years teaching 3rd and 4th, this is my first time seeing what my kids face at "the end of the line." It's daunting enough to teach a 4th grade who's reading two or three levels below grade. You do everything you can and hope you've set them up for success the next year. But being a part of the middle school admissions process this year has really opened my eyes to another aspect of the systemic nature of educational inequity in this city. The kids at PS 194 deserve better. We're working really hard as a school to give them what they deserve while they're with us. What is the city doing to help them while they're with us? What is the city doing to help them when they leave? 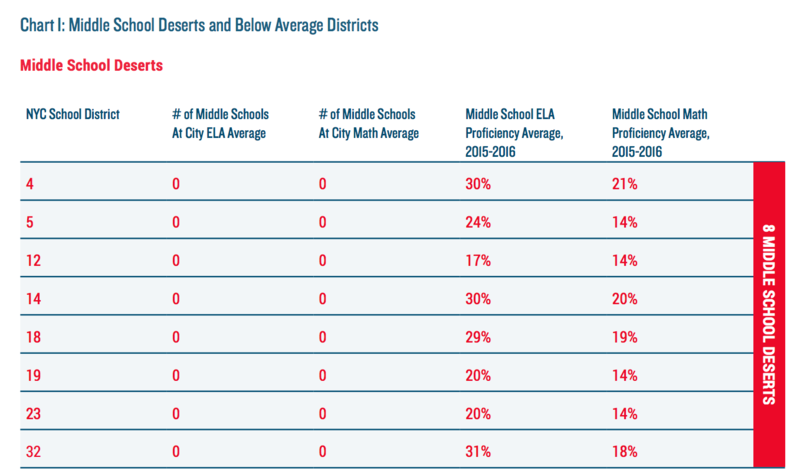 *While I disagree with StudentsFirst strongly in terms of their rhetoric and policy solutions, I do think the idea of a "middle school desert" applies to District 5. I just don't put all the blame on teachers. "Donald Trump had different opportunities"